Německá grindcore instituce je tady již od roku 1987 a přijede se strhující live show!!! Právě teď vychází jejich nové album Out of Singht které přináší 11 crusty grindcore záseků!!! Belching Beet was formed in 1987 by Migge (drums), Winni (guitar), Peter (bass) and Dirk (vocals). After recording two demo-tapes Dirk left the band and Watschi replaced him. In the end of the 80s and beginning of the 90s the grindcore-movement came up with bands like Napalm Death, Terrorizer, Septic Death, etc. and Belching Beet took their place in the grindcore scene by doing a lot of gigs with bands like Blood, Pungent Stench, Agathocles, etc. The underground roots of the band are documented by their 7 release you know that the holes are empty (Masters of Mayhem and Noise Records - 1989) and the split LP with the Australien band Rupture named kill for fun (Ecocentric Records - 1991). These publications show the band in their own and unique style, transforming the raw and brutal power from their live gigs directly on vinyl. In 1997 the bass player Peter left the band and was replaced by Bernd Biedenbach. 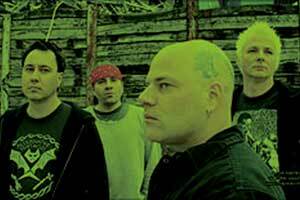 In July 1999 Belching Beet entered the studio again to record a Split-CD with Mindflair (Derliria Productions  1999). A Split-Picture 7 with their friends Malicios was also put out (unterfett.rex  2000) in this period. There is a coverversion of Septic Deaths Terrorain on this EP, which got a great response by Septic Death themselves. After the recording sessions the band did what they ever did: playing a lot of gigs with the next generation of grindcore bands like Mucupurulent, Mindflair, Abnorm, etc. all over europe. In the year 2000 the singer Watchi left the band and was immediately replaced by Vöhri one week before playing the Obscene Extreme Festival (Check Republic). In this final line-up the band also played the Soul Grinding Festival (France) in 2002 and several single-shows with bands like Macabre. The first recordings with the new singer were made for the Mucubelchingbeats-Project (Bizarre Leprous Productions  2002) with their special friends Mucupurulent. The bands played cover-versions of many different styles of music together, such as blue monday (New Order), green machine (Kyuss), love is a kind of mistery (Invisible Limits), thunder kiss 65 (White Zombie) and many more. In the year of the 20th anniversary (2007) the band recorded their first full-length album, which will be released on F.D.A. Rekotz (24.12.08).